The Vacaville Unified School District in Northern California serves 12,500 students at 18 schools in a bedroom community outside of San Francisco. Its mission is to provide academic excellence and choices to students that encourage individualized learning experiences. Vacaville partnered with CDI Computer Dealers in 2014 for a small Chromebook implementation and expanded the partnership in 2015, purchasing 13,000 Chromebooks for a district-wide 1:1 initiative. Technology Coordinator Jim Wasielewski said the district has been extremely pleased with the quality of CDI’s products, as well as the warranty and the prices CDI offers. The district also took advantage of CDI’s School Branding service to imprint the Chromebooks with the schools’ logos. In 2014, California was part of the Smarter Balanced Assessment Coalition (SBAC), which created new Common Core state standards in math and English Language Arts. School districts throughout the state were under pressure to update their technology so students could complete the SBAC assessments (now called the California Assessment of Student Performance and Progress or CAASPP) online. Vacaville needed to find reliable technology to facilitate this online testing that would be easy for students and teachers to use, and would also be simple for the district to manage. The district also faced an internal challenge of technology equity among its schools. Some schools had strong fundraising partners and were therefore able to afford the latest technology. Others lagged behind. Vacaville wanted to give all of its schools access to the same level of high-quality technology. In 2014 Vacaville School District voters approved a $180-million bond issue to renovate the district’s buildings and update its technology. This was the perfect opportunity for the district to implement a 1:1 initiative that would allow it to assess students online. Vacaville tested iPads and Chromebooks and ultimately selected Chromebooks as its student devices, and CDI as its partner. Each student receives a Chromebook at the start of each class period to use during that class. The devices do not go home with the students, nor do students carry them from class to class. Teachers have desktop computers or laptops. Wasielewski has been impressed at the impact of the Chromebook initiative. It has not only been a great solution for online testing, it has completely changed teaching and learning at Vacaville USD. Vacaville’s initiative has allowed teachers to take advantage of new types of curricula geared toward 1:1 classrooms. By providing a dedicated device for students to use every day, it has helped students feel comfortable creating and submitting projects online and using technology in and out of class, Wasielewski said. For example, students learn how to create and edit slide presentations including adding music. This is fun for the students and helps them learn the material, Wasielewski said. In the next few years, Vacaville will continue its Chromebook initiative with the help of CDI, Wasielewski said. 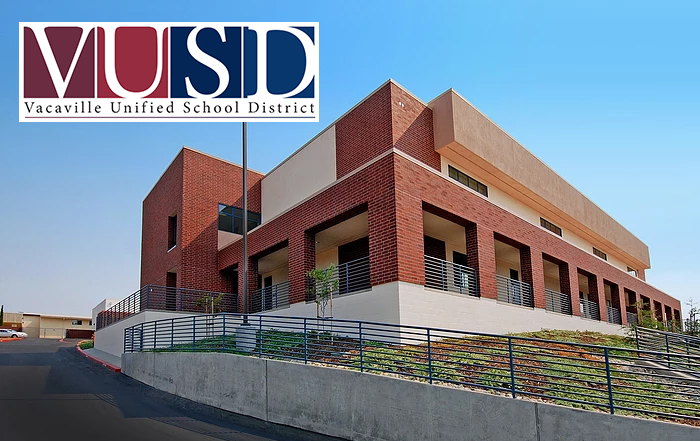 The bond issue and the partnership with CDI has helped Vacaville create an effective, sustainable 1:1 program that ensures technology equity for schools, meets the district’s goals for online testing, and opens up new opportunities for teaching and learning, both today and in the years to come.